Apple pessimism is on the rise. New Apple products are being questioned like never before. Even some of Apple's most loyal customers are beginning to wonder about Apple's direction. While many are directing criticism towards Tim Cook, nearly all of the criticism pointed towards Apple can in one way or another be traced back to a different person: Jony Ive. The two most powerful people at Apple are Tim Cook and Jony Ive. While Cook is tasked with making sure the Apple machine is being run by the best team possible, Jony's role is much more abstract. Cook aims to foster collaboration at the top of Apple's functional organizational structure. If something goes wrong, much of the criticism is quickly pointed at either Cook or one of his top lieutenants. (Phil Schiller and Eddy Cue seem to take the brunt of the criticism.) Cook has also taken on the more traditional CEO role of representing Apple in the outside world. However, the one area Cook does not have complete control over is product strategy. That distinction belongs to Jony. It may seem hyperbolic to consider Jony the most powerful person at Apple. He no longer spends much time managing anyone on a day-to-day basis. He doesn't speak on Apple's earnings conference calls. Wall Street knows very little about him, and neither does Silicon Valley. In fact, following his recent promotion to Chief Design Officer, Jony doesn't even spend as much time at Apple HQ these days. Yet Jony has such a significant influence over Apple's product strategy, it is safe to say we are firmly within the Jony Ive era at Apple. Jony holds an incredible amount of power because Apple is a design-led company. Apple's functional organizational structure and culture are set up in order to give the Industrial Design (ID) group absolute power. ID holds more power at Apple than any other group. This structure was put in place more than 15 years ago with the iMac being the first product to take advantage of this new culture. Up to the late 1990s, engineers held the most power at Apple. Designers were merely tasked with skinning Apple products created by engineers. With the iMac, ID was afforded the freedom to move ideas from conception to reality without compromise. While Steve Jobs was the primary architect of this new power structure, the relationship he had with Jony undoubtedly played a role. This transition from an engineering-led organization to one based around design was not easy, leading to high turnover throughout Apple's engineering ranks. Jon Rubinstein and Tony Fadell are widely believed to have been pushed out due to Apple's design-led power structure. The primary motivation for Steve Jobs to give ID absolute power was to allow Apple to make big bets and not have them get watered down by compromises that arise from having too many cooks in the kitchen. Jobs saw design as the best way to keep the user experience the most important priority during product development. ID was given the task of overseeing the user experience. Much of the criticism pointed towards Apple today is a by-product of Apple executives doubling down on Apple's design-led philosophy. The logic behind the move is pretty clear: The strategy works. Jony, Richard Howarth, VP of Industrial Design, and the rest of the ID team have more power today than at any other point in Apple history. Jony grabbed additional power during the first major management reshuffle under Tim Cook in 2012. His promotion to Chief Design Officer in 2015 reflected Jony receiving even more control. In fact, Jony has so much control, he now is able to spend more time away from Apple HQ (which I suspect is related to Project Titan). ID has complete reign over Apple. This may seem like an overstatement, but take a look at how ID has impacted Apple's overall product direction during the Tim Cook era. Apple's move into wearables, health, and fashion? Jony and the ID team. Apple's move into cars and transportation? Jony and the ID team. This isn't to suggest that Apple isn't empowering other groups within Apple, including those focused on developing services, machine learning and other core technologies. In addition, it would be a disservice to not point out the hardware engineering talent Apple has been accumulating. These groups work closely with ID on turning ideas into products, often creating brand new manufacturing apparatuses from scratch. However, at the end of the day, Apple executives depend on ID to look after the user experience like never before. It would be incorrect to position Jony as single-handedly guiding every Apple product from conception to shipped product. Not only would such a statement grossly mischaracterize how much input actually comes from the rest of the ID group, but Jony has traditionally doled out the lead designer role for each product to different people. For example, Howarth was tasked to oversee iPhone design and ended up playing a crucial role in iPad, along with Christopher Stringer. Instead of playing a day-to-day role, Jony's influence at Apple reveals itself in terms of the company's overall product direction and narrative. There are five examples of how Jony is making people extremely uneasy. Apple is looked at as being too focused on device thinness instead of pushing for better battery as if the two attributes share some kind of direct relationship. Apple's infrequent hardware refresh cadence has led some to question if Apple is losing its smartphone design edge to Samsung. Apple's decision to eliminate the 3.5mm headphone jack from the new iPhones has led many to question if Apple executives have lost their minds. For each one of these items, criticism can be traced back to Jony. We are merely seeing Apple continue on the same design path that they were on when the first edition iPhone was launched in 2007. Jony's long-standing goal is to have the iPhone's screen take precedence above all else. This means that ID will likely have the iPhone evolve into nothing more than a display with as few physical distractions or unnecessary additions as possible. Most ports, buttons, and excess bezel will be removed. The design changes rumored to be included in the 2016 and 2017 iPhone models certainly seem to fit ID's long-term goal for iPhone. 2) Mac. The sheer panic that the lack of Mac updates has caused some people is nothing more than ID shuffling resources and priority. Instead of updating older Mac models merely for the sake of updating, something that isn't that difficult to do, Apple continues to push the boundary with the Mac by mostly focusing on design and the user experience. We saw this firsthand in March 2015 with the new MacBook. All signs point to the second phase being announced soon with an updated MacBook Pro. To complete the Mac line, the iMac will eventually see a redesign in order to give the product an even firmer position in an increasingly mobile world where smaller screens are grabbing all of the attention. Overall, the Mac still has a role to play, but I suspect its priority is continuing to fade in the eyes of ID. This is classic resource allocation at Apple as devices capable of making technology more personal take priority. 3) Apple Watch. Apple's entry into the wearables space and corresponding deeper relationship with fashion and luxury themes originate with Jony. While a growing number of Apple users are poking fun at the amount of attention Apple has been giving to Watch bands over the past year, the bands go a long way in explaining how Apple managed to sell 15M Apple Watches to date. More importantly, the broader Apple Watch category highlights Jony's quest for using design to make technology more personal. Apple is clearly positioning Apple Watch as the evolutionary outcome for iPhone, something that the vast majority of the population do not yet see as a possibility. 4) Accessories. New Apple accessories including the Apple Pencil, Magic Mouse 2, and iPhone Smart Battery Case have been ridiculed by many in the tech press. 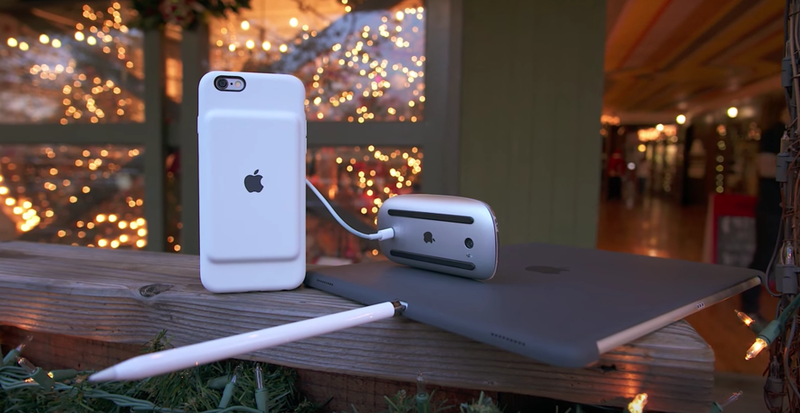 Some people are wondering if Apple has given ID too much power as no one wanted to say "no" to these accessories and their seemingly awkward charging experiences. All of those accessories can in one way or another be traced back to Jony. The Apple Pencil has many trademarks of Jony, including how the top cap is designed to be played with in hand. The Magic Mouse 2 charging position makes plenty of sense when compared to the older battery-powered Magic Mouse. (A one-minute charge gives a half a day's worth of usage.) Listen to Above Avalon Podcast Episode 45, "People Love Accessories," for a more detailed discussion on Apple's accessories. 5) Project Titan. While consensus is still coping with the idea that Apple is designing its own car and it took more than a year for some to wrap their mind around the idea, there is still an elevated sense that Apple must be very desperate to want to move into the auto industry. In reality, the Project Titan startup is a design-led initiative. This goes against prevailing wisdom in the tech industry that says the future of the car will be determined by autonomous driving. I disagree. Instead, design will be the factor that allows us to redefine the car. Jony and Marc Newson are likely the two most powerful people currently working in the car industry given their interest and expertise in industrial design, which includes working with new materials and manufacturing techniques. One of the key aspects of Project Titan will be coming up with new ways to manufacture car parts, a key strength of both Jony and Newson. One aspect of Apple that is rarely discussed is how the company has seen most of its success in a relatively short amount of time. In the span of just seven years, Apple unveiled three brand-new categories (iPhone, iPad, Apple Watch) that cumulatively bring in $150 billion of revenue per year. Not enough time has passed for us to get proper historical perspective on how some of the decisions being made by Cook will end up impacting Apple. On paper, things look fine and all indications suggest Apple's product pipeline is healthy. However, it will take years to properly analyze the decisions Cook is making today. However, when it comes to product strategy, I suspect that in a few years, when we look back at this current stretch, we will refer to it as the Jony Ive era at Apple. Existing products like iPhone and iPad are seeing evolutionary design changes that fit with Apple's long-standing design language put forth by Jony. Apple is embracing luxury in an entirely new way, all the way down to how it designs its brick- and-mortar locations and headquarters. Apple is running quickly into automobiles and transportation, which has the potential to shape the direction of the company for the coming decades. All of these changes are making people uneasy. Some think Apple's design-led culture doesn't fit within today's changing tech landscape. Others think Apple is running out of ideas. Instead, the opposite is true. By doubling down on design, Apple is placing a rather large bet. Apple executives think design will continue to allow Apple to remain focused on the customer experience. It is this customer experience focus that will then keep Apple relevant and able to ride the technology waves like no one has done before. It all comes back to Jony and the ID philosophy that is guiding Apple. If you have doubts about Apple, you probably are uncomfortable with Jony's vision for the company.